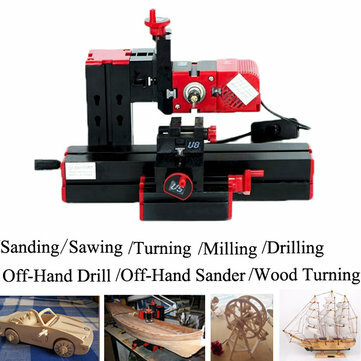 6 in 1 multi metal mini wood lathe Machine -enjoy the joy of creation with "Transformer"
6 in 1 multi metal mini wood lathe not only has single unit, such as Jig-saw, grinder, Driller,wood lathe, metal lathe, Miller, but also has the 6 in 1 combined set. Base is made of advanced aluminum alloy, and it's durable and not deformed. This is really a good tool. from 1st, November. 2015, and the normal operation can not be effected. Hope all the customers' kindly understanding. 10)It is specially designed that it is very safe when operating. Always make sure that the tool and workpiece are each properly secured. Never connect the transformer output in parallel with other transformers! If lead, plug or case of the transformer is damaged, discontinue using the transformer immediately!